Bohemian FC is calling for the redevelopment of Dalymount Park to go ahead despite a supermarket chain's objection. Developer MM Capital has accused Tesco Ireland of preventing the progress of the €50m plan and said the redevelopment of the stadium and Phibsborough Shopping Centre was "likely" to be shelved. The plan would see the centre overhauled, but Tesco has said it would mean the store is unable to receive deliveries. Bohs, who are set to benefit from the redevelopment and join rivals Shelbourne FC in using the new stadium, have called for the "impasse" to end. "We call on the parties involved to work together to resolve their differences to allow for this once-in-a-lifetime opportunity to deliver the integrated design of Phibsborough village centre," a statement from its board said. "We believe the main fall-out from a possible non-integrated development would be the obvious loss to the community." Tesco Ireland told the Irish Independent it had not made any fresh demands. "We have been consistent across all our dealings with MM Capital over several years and right up to today," a spokesperson said. "Our position throughout the very extended planning process is that we are seeking to maintain deliveries for our store. "Currently the store receives deliveries to the front. This right to deliver to the front is contained in our deed of conveyance and we've been making deliveries in this manner for over 20 years." Derek Poppinga of MM Capital said "how [Tesco] deliver currently is dangerous because it's across Phibsborough through a public footpath. We are trying to rectify this danger that Tesco seems comfortable with. This scheme doesn't impact their right to deliver." 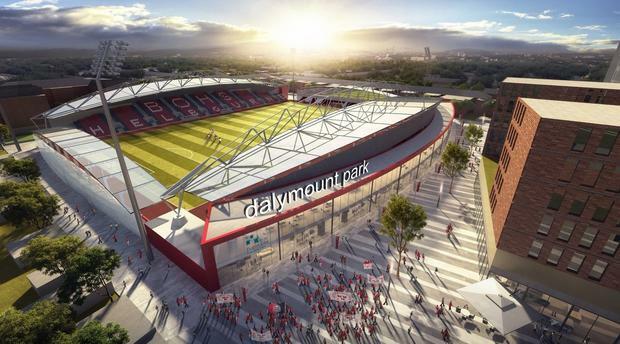 Dublin City Council said it was aware MM Capital had released a statement which noted the redevelopment plans for the shopping centre and Dalymount Park may be in jeopardy. "Dublin City Council is fully committed to the Dalymount Park redevelopment project and intends to see this historic venue fully developed into a vibrant municipal stadium in the coming years," it said. Tony Considine Waterford FC have been denied a licence to compete in European competition for the 2019/20 season.